The American statesman Governeur Morris was born in the old Morrisania manor house, in what is now New York City, on the 31st of January 1752. He graduated at King's College (now Columbia University) in 1768, studied law, and was admitted to the bar in 1771. New York, then in the midst of the political disturbances which preceded the outbreak of the War of American Independence, offered a good opportunity for a public career, and Morris had the aristocratic connections which tradition required. An extreme aristocrat in his political views, he distrusted the democratic tendencies of the Whigs, but a firm belief in the justice of the American cause led him to join their ranks. His half-brother, Staats Long Morris (1728-1800), was a Tory, fought in the British army, and became a major-General. Gouverneur served in the New York Provincial Congress in 1776-1777, was perhaps the leading advocate in that body of a declaration of independence, and after the Congress had become (July 1776) the "Convention of the Representatives of the state of New York", he served on the committee of that body which prepared the first draft of the state constitution. He served in the Continental Congress in 1777-1779, and was enthusiastic in his support of George Washington. In 1778 he was selected chairman of the committee to treat with Lord North's conciliation commissioners, and as such presented the famous report, adopted by a unanimous vote of Congress, which declared that the recognition of independence must precede any negotiations for peace. He settled in Philadelphia as a lawyer, and in February 1780 he published in Philadelphia a series of essays on finance, in which he criticized the issue of legal-tenders, denounced laws passed for the benefit of the debtor class, and urged the people to tax themselves for the common good. From 1781 to 1785 he was assistant to Robert Morris (no relation), superintendent of finance. In 1782 he prepared an elaborate report on the coinage, suggesting the use of the decimal system and of the terms dollar and cent. With some modifications introduced by Thomas Jefferson, notably the adoption of a higher unit of value (the dollar instead of one-tenth of a cent), this plan constitutes the basis of the present American system. 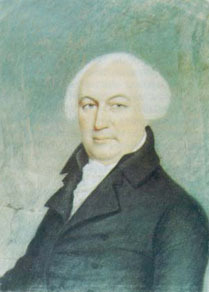 Morris was one of Pennsylvania's representatives in the constitutional convention of 1787, and took an active part in the debates. His influence was weakened, however, by his cynicism and by his ultra-aristocratic views. He favored a strong executive holding during good behavior, an aristocratic senate appointed by the president for life, and the restriction of the suffrage to freeholders. The struggle which the frontier settlers of Pennsylvania had made in the state legislature to secure unlimited issues of paper money and the enactment of laws favorable to the debtor class prejudiced him against the West, and he tried to introduce into the constitution a clause guaranteeing forever the political supremacy of the states east of the Alleghanies. He was instrumental in securing the executive veto and in defeating the proposal that the legislature should elect the president. He also gave able support to the nationalistic and anti-slavery factions in the convention. He was the member of the committee of revision selected to draft the constitution in its final form, and that document is a monument to the vigor and simplicity of his literary style. In 1787 he bought Morrisania from Staats Long Morris, and returned to New York to live. He went to France in February 1789 on private business, and remained abroad for nine years, passing most of the time in Paris, London, and the German capitals. In 1792 he acted as financial agent in a daring attempt to secure the escape of the king and queen from Paris. He was appointed United States minister to France in 1792, and was the only representative of a foreign country who remained at his post throughout the Reign of Terror; but his ill-concealed attitude of hostility to the Revolution gave offense, and in return for the recall of Genet, at the request of the United States, the French government, in 1794, asked for the recall of Morris. Business and pleasure, however, still detained him in Europe for four years longer. He returned to New York in 1798, resumed the practice of his profession, re-entered politics, and sat in the United States Senate as a Federalist from 1800 to 1803. As early as 1801 Morris became interested in projects for improving the communication between the Hudson river and Lake Erie, and from 1810 to 1816 he was chairman of the board of canal commissioners, which after exploring the country prepared plans for the Erie Canal. He was bitterly opposed to the war of 1812, and openly advocated the formation of a northern confederacy to escape the rule of the "Virginia dynasty." He died at Morrisania on the 6th of November 1816. His half-brother, Lewis Morris (1726-1798), a signer of the Declaration of Independence, was educated at Yale, served in the Continental Congress from 1775 until early in 1777, and went on a mission to the western frontier in 1775 to win over the Indians from the British to the American side. He joined the army as brigadier-general of militia in June 1778, and served in the New York Senate in 1777-1781 and 1784-1790.